In this issue we’ve got piles – or, given that we make cables, miles – of news for you. Our Bulk Cables division has been busy – just take a look at the SQ434Y. This high-end microphone cable uses the highest-quality materials to deliver superb sound. With its effective design and shielding features, external interference doesn’t have a chance – thanks largely to the symmetrical StarQuad design. We’ve also launched a new solution for safety-critical environments like airports, railway stations and sports stadiums: our SCFX speaker cable has PH120 rating, and thus remains functional for two hours in the event of a fire. When microphone signals need to be transmitted across long distances in outdoor applications, we can now offer a wide range of drum systems – and captured them perfectly in new photos for our Online Shop. 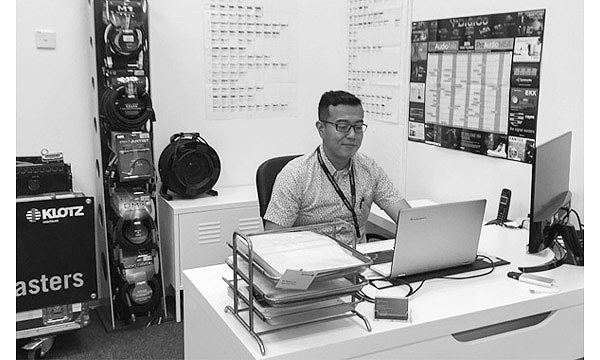 Norman Lim, our Regional Sales Manager ASIA + APAC, is already at home in our new Singapore office premises, which opened at the start of the year. From the new office base, Norman is expanding our market position in Asia – a key region for our business. The SQ434Y is our high-end star quad microphone cable. In star quad cable design, which is used in communication technology, four strands are twisted together, with opposing strands forming a pair. StarQuad cables thus have symmetrical paired conductors and are extremely effective at reducing external interference. To boost interference resistance still further, the cable has an extra-dense braided shield with over 95% coverage. Top-class materials add up to a high-end microphone cable with excellent attenuation, negligible microphonics and outstanding symmetry. The SQ434Y delivers sound with superb dynamics and flawless fidelity. Safety is a particularly high priority in high-traffic public places such as airports, railway stations and sports stadiums. One aspect of achieving maximum safety is ensuring that in case of fire, cables remain fully functional over an adequate period of time. Our SCFX Speaker Cable is designed for safety-relevant environments and has PH 120 rating in accordance with the DIN EN 50200 standard. This means that in the event of a fire, the cable’s insulating layers will protect the inner conductor cores for 120 minutes. The conductors are insulated with silicone rubber, which hardens when exposed to heat. Conductor contact is prevented, the risk of a short-circuit is avoided and the cables remain functional. In addition, the outer jacket of the cable is flame-retardant, non-corrosive and halogen-free. We often receive enormously wide-ranging product requests, particularly in the field of hybrid cables. In fact, our HV2RC1 is the result of just such a development process. The cable combines two VD125LPS video lines and a RC6-LB1 RamCAT 6 line. Typical areas of use are with PTZ and dome cameras, requiring video out and return lines (or sync) for the video signal plus a signal conductor for remote control and POE (Power over Ethernet) power supply. The VD125LPS video cable has all the features that are essential for meeting modern needs: a double braided shield of tinned copper delivers optimum shielding at over 95% coverage, while the low attenuation enables the cable to be used for HD-SDI applications over distances of up to 100 m.
The RC6-LB1 RamCAT 6-flex cable is also a top player; its four twisted-pair inner conductors have a PE cross separator for extra stability, plus carefully matched lay lengths offering outstanding crosstalk attenuation. The double shield (braided and foil) virtually eliminates external interference. The HV2RC1 cable, with its sophisticated twisted-core design (100% back-twist), combines all the advantages of the individual cables used to make it up, and is finished with a rugged PVC jacket that offers excellent resistance to mechanical strain. Long cable lengths need not always be a technical headache. With our Drum Systems for microphone cables, technicians will never groan at long cable lengths again. These Drum Systems are the ideal choice for outdoor uses involving long distances. They are available in a variety of models, with XLR connectors in the drum core or with flexible cable end. The cables used in the Drum Systems range from the solid, reliable M1 budget cable to the pro level M5 cable – always on a breakproof plastic drum. The XLR connectors are supplied in rugged heavy-duty versions with gold-plated contacts, ready for life on the road, and have IP65 splashproof rating. We have highlighted these features in the new high resolution photos in our Online Shop. BCA 2017 in Singapore has been and gone. During the event, from 23 - 25 Mai, we presented our new developements as well as our proven bestsellers to the interested audience. Our thanks go to all visitors to our stand! The trade show was a never-ending stream of pleasant encounters and animated discussions with customers, business partners, suppliers and interested amateurs. The orders and sales we make at our stand confirm our loyalty to the event, and contribute to our well-filled order books. Once again, clear confirmation that we’re on the right track with our innovative products! Our Singapore sales office has now opened, with lots more space and lots more service. Norman Lim, our Regional Sales Manager for the ASIA and APAC region, is the head of our new office in Singapore, which opened at the start of the year. Norman, who studied Business Informatics and Logistics in Dublin and Singapore, is supporting us in expanding our market position in Asia, a key region for our business.